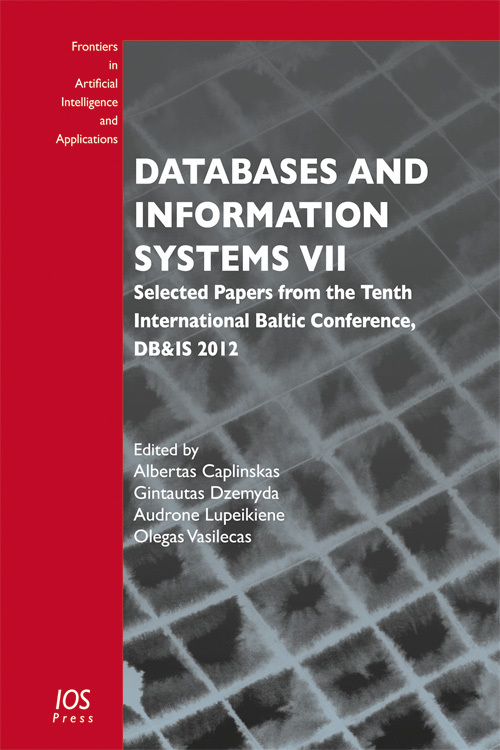 This book presents 27 of the best revised papers selected from the 43 papers accepted following stringent peer review for the 2012 International Baltic Biennial Conference on Databases and Information Systems (Baltic DB&IS 2012), held in Vilnius, Lithuania, in July 2012. The conference provided a forum for the exchange of scientific achievements between the research communities of the Baltic countries and the rest of the world in the area of databases and information systems, bringing together researchers, practitioners and Ph.D. students from many countries. The subject areas covered at the conference included databases, data mining and optimization in IS, business modeling, cloud computing, IS engineering tools and techniques, as well as advanced E-learning environments and technologies. The book also includes presentations from two of the invited speakers at the conference: Exponential Growth of ICT: How Long Can It Last, by Prof. Arne Sølvberg and Variable Systems Model in Information Systems Development by Prof. Marite Kirikova.